Well for over a month now I've been using things out of the kitchen cupboard for all my hair care. Get this, u can use a lot of the stuff u drink to wash your hair and it won't strip your hair of the natural oils that your hair needs like store bought shampoo. I took a picture of most of the things I use. Herbal teas can be used all the time as a rinse and supposedly speed up hair growth-chamomile tea is said to do that. Nettle is another herbal tea with no caffeine. I make the teas ahead of time and keep them in the fridge. Green tea can be used once or twice a week as it has caffeine (great for the scalp) but using it too frequently may dry out your hair. Concentrate the teas by 2X (1 cup is 2 tea bags). I use that plastic condiments squeeze bottle in the center to squeeze the stuff on my wet hair and focus on my scalp. After it's done (I drench my head) I massage it into my scalp for a couple minutes. There are different methods of massaging the scalp. I'm follicly challenged so my hair is thin and the baby hairs break easily so I don't want to end up with hair on my hands after a massage so I press on different areas of my scalp with the spongy tips of my fingers to make the scalp skin move a bit and don't let my hands slide over my hair doing this. Then I let go of the scalp and move my fingers to another area of the scalp and do it again. The purpose of this it to get the blood flowing on the scalp (under the skin) so that your hair roots absorb the tea u just administered and it needs blood to do that. I saw a therapist on a youtube video do this and she says u want to get your scalp as loose as the skin near your eye but if u just wanna rub it in circles the way a regular massage is done, that'll work too but u just don't wanna pull out weak hair. I like to put peppermint oil in everything. I like the smell and it's supposed to speed up hair growth. 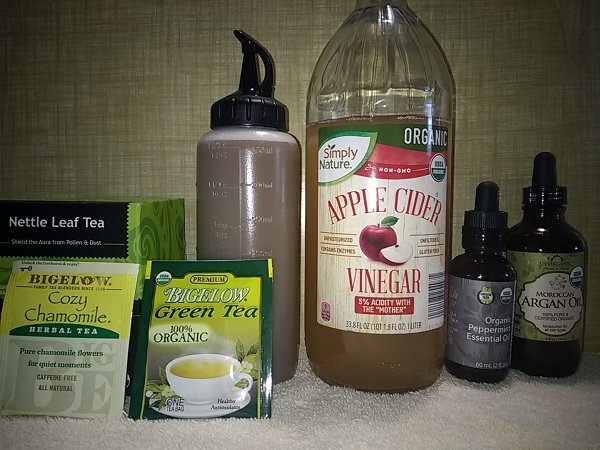 It is concentrated so just 4-6 drops in a tea rinse should be good. It will be tingly and burns in the eyes...close your eyes. Rinse off the rinses with cool water. I put those tea rinses on my head when I first get in the shower and then let it sit there while I wash. Then rinse with water after a couple minutes. When u rinse the rinse, your head shouldn't feel too oily but it won't get squeaky clean either. So what's missing? The conditioner! When I get out of the shower I moisturize with a hair oil mixed with water. Argan is one that I use and I have a bottle with half water and half oil that I pour into my hands. Not much-just a dime size for me with 4" hair. Close your eyes while doing this-the vinegar and peppermint will sting. I again use that squeeze bottle. Mix everything a glass jar or cup (the vinegar and baking soda will react for a bit) and then funnel into the squeeze bottle. I pour it on my wet scalp and hair, massage and let it sit for a while just like the tea rinses. The peppermint oil should cover up the vinegar smell but if not then don't worry because the vinegar smell will disappear as your hair dries. Some sites say this is a conditioner but not like most people are used to and like the tea rinses leaves some natural oils in the hair. I didn't include this in the picture but coconut milk makes a great hair moisturizer. I saw u can make a deep conditioner with it. Use the canned stuff and drain the watery stuff off. Blend it with some coconut oil. It should be kinda thick and put it all down the length of your hair and then let it sit there for a couple hours. Wrap your head with a bandana to keep from making a mess. Then rinse off what's left with cool water. Hope this helps somebody! I left a link of more natural hair shampoos u can make yourself.